FEARS HAVE BEEN raised about the impact that Brexit could have on Ireland’s alcoholic products – particularly smaller brewers. Checks along the border could end the free-flowing supply chain, delaying the packaging process and increasing costs. Since 1759, Guinness has been brewed at the St James’s Gate brewery, a vast brickwork complex on the River Liffey. Tankers then bring the stout across the border to be packaged in Belfast before they’re shipped abroad. It happens on both sides of the border. This week, representatives of the Alcohol Beverage Federation of Ireland met with the EU Commission’s Taskforce Article 50 to discuss their concerns. “Tariffs on our cross-border supply chains would add significant costs to Irish and Northern Irish whiskey distilleries and breweries, damaging cost-competitiveness and threatening sales and jobs,” Callan said. This all-island economy business-model isn’t unique to the drinks industry either: the farming community in Northern Ireland send 40% of sheep to the south, and milk in Northern Ireland is sent to factories in the south where it’s then turned into cheese (more on how this works here). Both the UK and Irish governments have pledged that no hard border infrastructure will interrupt trade between Ireland and Northern Ireland after Brexit. But the UK and EU are locked in a stalemate over the “backstop”, which both sides agreed in December would ensure there would be no hard border in Ireland through agreeing “regulatory alignment” on the island of Ireland if no other deal is agreed. Little progress is being made and, as the 29 March divorce date approaches, the spectre of border checks is vexing the Irish drinks industry – which makes 23,000 border crossings yearly, according to Callan. “Any delay at all to that, even an hour’s delay, would work out at about €100 per truck cost,” she explained. Guinness is owned by global drinks goliath Diageo, which with 2017 net sales in excess of €14 billion, holds coffers likely capable of absorbing economic shock. A 7.2% tariff on apples grown in Northern Ireland used in cider production south of the border. Seamus Leheny of Northern Ireland’s Freight Transport Association said Brexit turbulence could cause complications for Diageo’s Northern Ireland plant. But in its 2019 Interim Results release, published on 31 January 2019, Diageo said that it had no plans to change its supply chain. We have further considered the principal impact to our supply chain, which we have assessed as limited, and have appropriate stock levels in place to mitigate this risk. The full implications of Brexit will not be understood until future tariffs, trade, regulatory, tax, and other free trade agreements to be entered into by the United Kingdom are established. 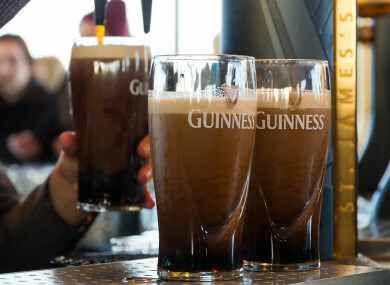 Guinness is the eighth largest beer export in Europe, valued at €273 million in 2017 according to October figures from the Irish Brewers’ Association. The pub is just half a kilometre away from the border on the busy motorway link between Dublin and Belfast. “This pub’s known for a good pint of stout,” veteran landlord John Fearon told AFP. It’s hard enough to get customers in here at the moment. This article was updated on the 8 February 2019 to include a statement from Diageo’s interim report, which contradict other third party statements that the company’s supply chain would be “seriously disrupted”. Email “Here are the problems the 'all-island' drinks industry could face because of Brexit”. Feedback on “Here are the problems the 'all-island' drinks industry could face because of Brexit”.